A beautifully delicate quite sturdy necklace of three strands pearls in color turquoise Blue Pearls Floating Illusion necklace & at the back of necklace extension drop down 1 pearl with earrings. Jewelry for Bridesmaid flower girls inspired by vintage glamour necklace earrings set for special occasions & modern classics for everyday. 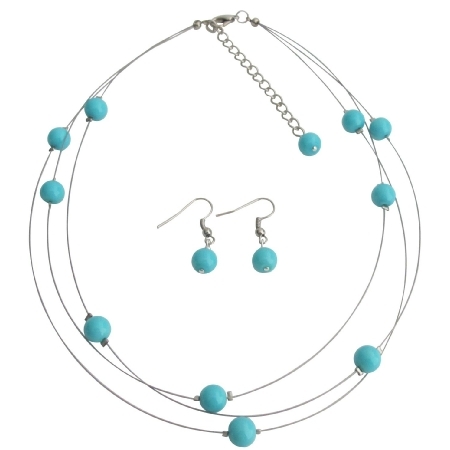 Material : 8mm Turquoise Blue pearls adorned in illusion wire with rhinestones rings spacer with surgical post earrings.